Contrary to popular belief, the vast majority of funds raised from transportation sources like the Motor Fuels Tax, license and vehicle registration fees are used for transportation purposes. Maintaining existing highways and bridges and building new ones – plus supporting public transportation, ferries and rail throughout our state – relies upon the transportation revenue raised from a handful of sources. The Highway Fund Provides resources to maintain the State road network, funds administrative expenses of NCDOT and the Division of Motor Vehicles, and supports multi-modal programs including public transportation, aviation, ferries, rail, and bicycle and pedestrian program. The Highway Fund also provides resources for secondary road construction and aid to municipalities for road maintenance. 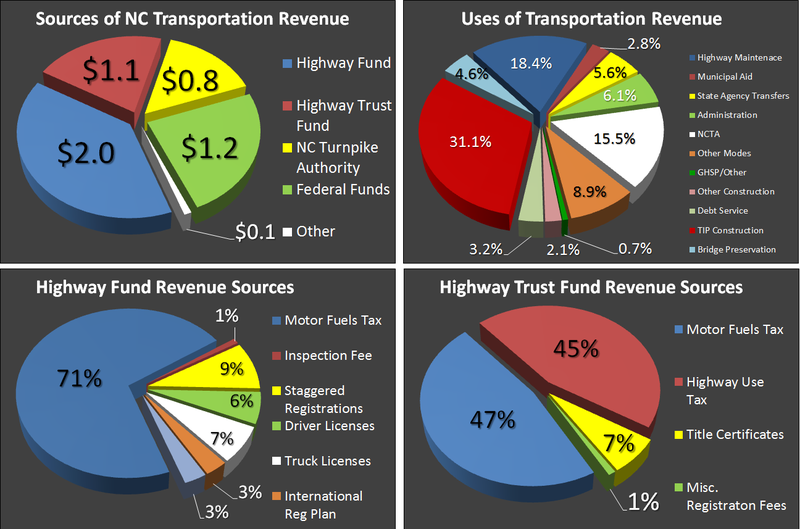 The Highway Trust Fund – Revenues are used to design and construct legislatively designated intrastate (primarily US and NC routes) and loop highways; revenues also provide supplemental support to municipalities for road maintenance and secondary road construction. In addition, the required federal-aid match comes from the Highway Trust Fund. North Carolina Turnpike Authority (NCTA) funds are derived from toll revenues generated from the toll road projects constructed by the Authority and a fixed amount of statutorily defined annual payments from the Highway Trust Fund dedicated to specific Authority projects. Staggered registration fees are paid annually for all private passenger vehicles, vehicles for hire, motorcycles and certain motor homes required to be registered with the Division of Motor Vehicles. Fees are based on the type of motor vehicle and its use. Driver’s license fees are paid by persons at least 16 years of age and licensed by the Division of Motor Vehicles. The State charges several fees for learner’s permits, basic operator licenses, chauffer licenses and commercial licenses. Truck license plate fees are levied on all commercial property hauling vehicles that are required to be registered based on weight and load capacity. A base fee plus a variable component that is calculated on per 100 pounds of gross weight is charged. International registration plan is a reciprocity agreement for motor carriers in the United States and Canada. Registered vehicles pay a fee based on fleet distance traveled in member jurisdictions. Gasoline inspection tax is charged at a rate of ¼ cents per gallon on all petroleum products sold to pay for the costs of inspection to ensure the quality of the products being sold. Other fees encompass dealer and manufacturer license fees that are paid by individuals or corporations that are engaged in the sale of new or used vehicles; financial security restoration fee which is charged to a motorist as a civil penalty for failing to maintain liability insurance; fees charged for overweight and oversized vehicles; registration fees for certificates of title and registration cards and plates; safety inspection fees. Transportation Improvement Program (STIP) is NCDOT’s five-year work program which outlines specific funding levels for all NCDOT divisions. GHSP is the Governor’s Highway Safety Program, which promotes highway safety awareness and reduce the number of traffic crashes and fatalities in the state of North Carolina through the planning and execution of safety programs. Municipal Aid provides federal aid funds for bridges that are located on municipal streets and are not part of the state highway system. Other Modes includes bike/pedestrian, ferries, and public transportation like buses and rail.